Gareth Hinds is NPL Fellow and Science Area Leader in Electrochemistry, leading a team of scientists undertaking ground-breaking research in corrosion, electrochemical energy conversion and storage, and interfacial chemistry and catalysis. 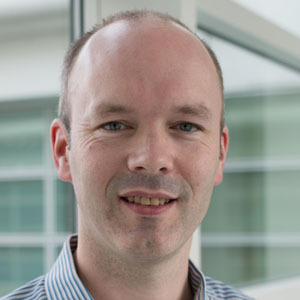 Gareth’s primary expertise is in the development of novel in situ diagnostic techniques and standard test methods for assessment of corrosion and material degradation in energy applications. Gareth has a strong track record of delivering innovative solutions to engineering problems with demonstrable impact on industry in a range of sectors, including oil and gas, power generation and electrochemical energy conversion and storage. Gareth has established and continues to lead NPL research in electrochemical energy conversion and storage, which is focused on the development of novel in situ measurement techniques, modelling tools and standard test methods to support commercialisation of polymer electrolyte membrane (PEM) fuel cells/electrolysers, and high energy density batteries. Recent highlights include an innovative reference electrode that allows mapping of the spatial variation in electrode potential across the active area of PEM fuel cells and electrolysers; a novel galvanostatic technique for simultaneous measurement of electrochemical active surface area of each cell in a fuel cell stack; 3D real time imaging of lithium-ion batteries during thermal runaway; and the development of a multiphysics model of PEM fuel cell performance in an accessible software platform. Gareth is also heavily involved in the development and standardisation of novel test methods for materials selection in the oil and gas industry. Recent achievements include the development of a novel method for measurement of pitting susceptibility of materials in representative oilfield environments; an experimental technique for validation of predictive models of the chemistry of oilfield environments; a multi-electrode technique for evaluation of the performance of inhibitors for underdeposit corrosion; and the adaptation of the drop evaporation test method to the determination of the threshold temperature for coating of duplex stainless steels in evaporative seawater conditions. He has carried out research, testing, failure analysis and provided expert advice on corrosion and material degradation for a wide range of clients, primarily in the energy sector. Gareth is the author of over 150 publications, including 66 peer-reviewed journal papers, 20 conference papers, 62 NPL technical reports and several trade journal articles. He sits on international standards committees IEC TC 105 (Fuel Cell Technologies), IEC TC 21 (Secondary cells and batteries) and ISO TC 67 (Materials, equipment and offshore structures for petroleum, petrochemical and natural gas industries). Gareth is a Chartered Engineer and Fellow of the National Association of Corrosion Engineers (FNACE), the Royal Society of Chemistry (FRSC), the Institute of Corrosion (FICorr), and the Institute of Materials, Minerals & Mining (FIMMM). He is currently serving as Vice President of the Institute of Corrosion and is Past Chair of its Corrosion Science Division. He is also a member of several NACE technical committees and sits on the Corrosion Committee of the Institute of Materials, Minerals and Mining and the UK Corrosion Network. Gareth holds visiting academic positions at University College London (UCL), the University of Strathclyde and Harbin Institute of Technology, China.